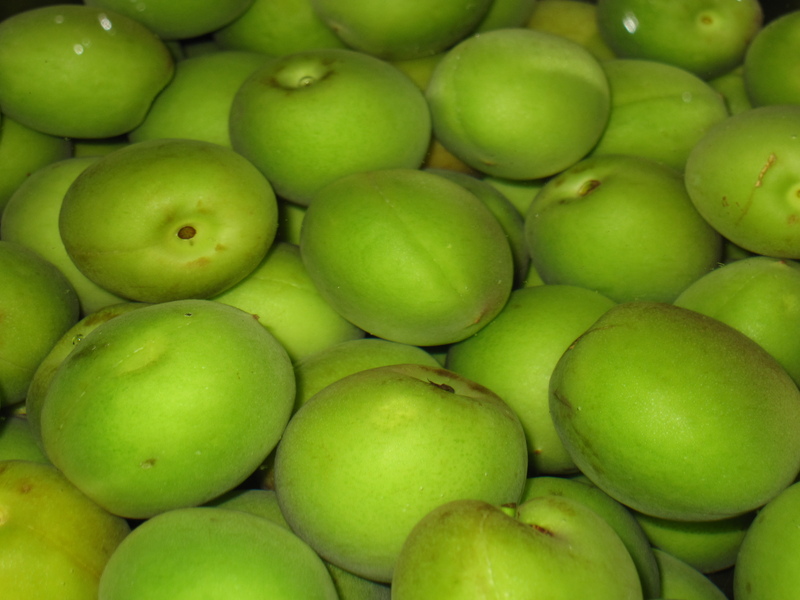 Umeshu, usually translated as “plum wine,” is a Japanese liqueur made with ume plums. It is a very smooth, sweet drink that is marketed mainly to women, but I don’t know anyone who dislikes it. Numerous commercial varieties are available, and many people in Japan also make their own at home. Late last summer, we tasted some that friends had been aging for over a year. It was rather dark, and its flavor included hints of cinnamon, clove and pepper in addition to the usual sweetness. They hadn’t done anything special in making it; it just happened to turn out that way. Who knows why? 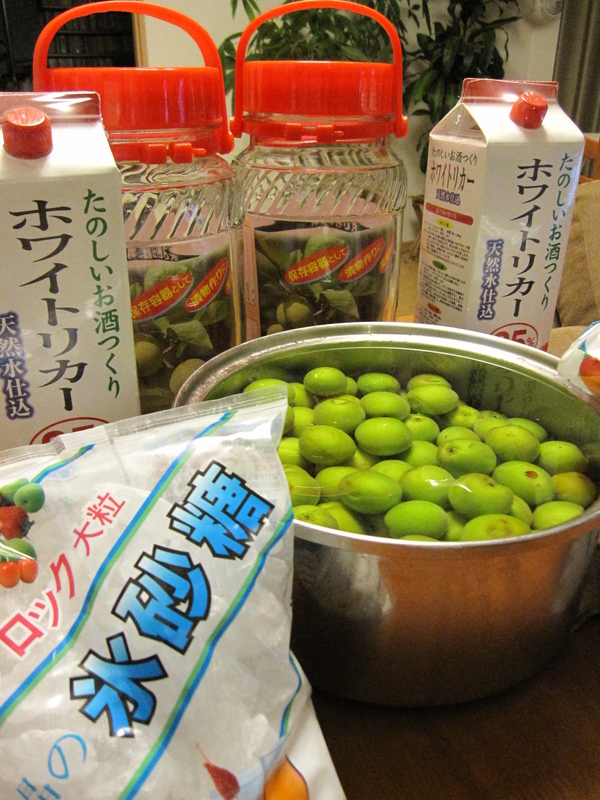 Intrigued, I decided that we had to make our own umeshu. The fruits were out of season by then, but they are finally falling from the trees again (and turning up at the supermarket). 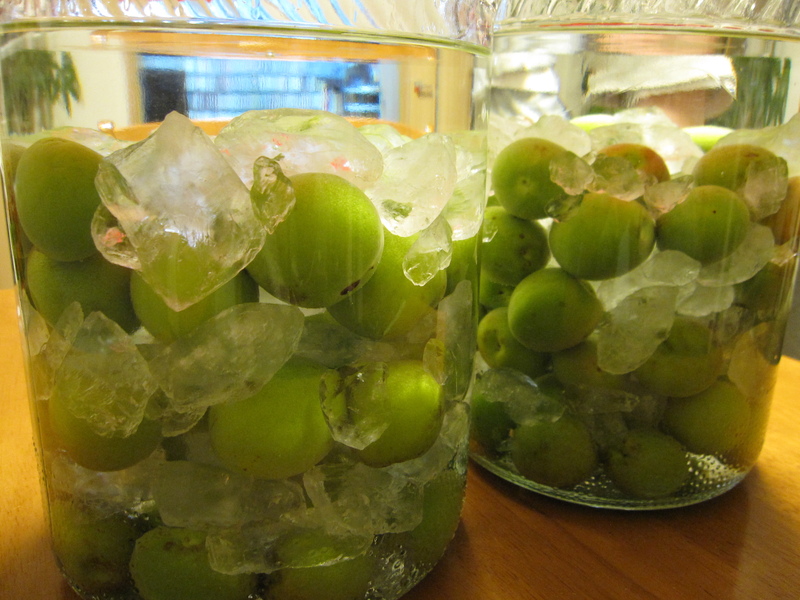 First, we soaked the ume in water for a couple of hours. This could have been as long as all day or overnight. 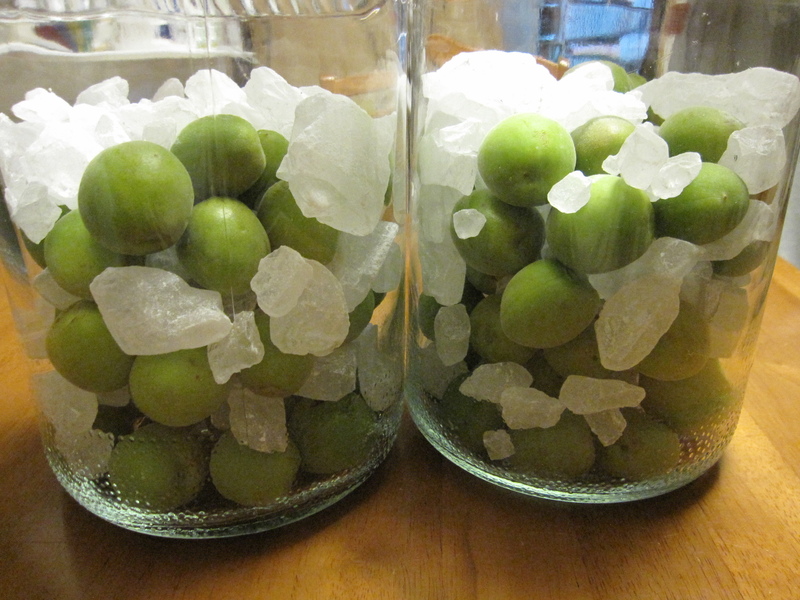 The necessary materials are pretty simple: ume plums, rock sugar, "white liquor" and some large storage jars. Supermarkets in Japan stock all of these things this time of year. The cheapo white liquor we bought, one of several brands sold in cartons, came with recipes for a variety of fruit liqueurs -- even garlic liqueur. Sounds interesting, but we'll stick with ume for now. 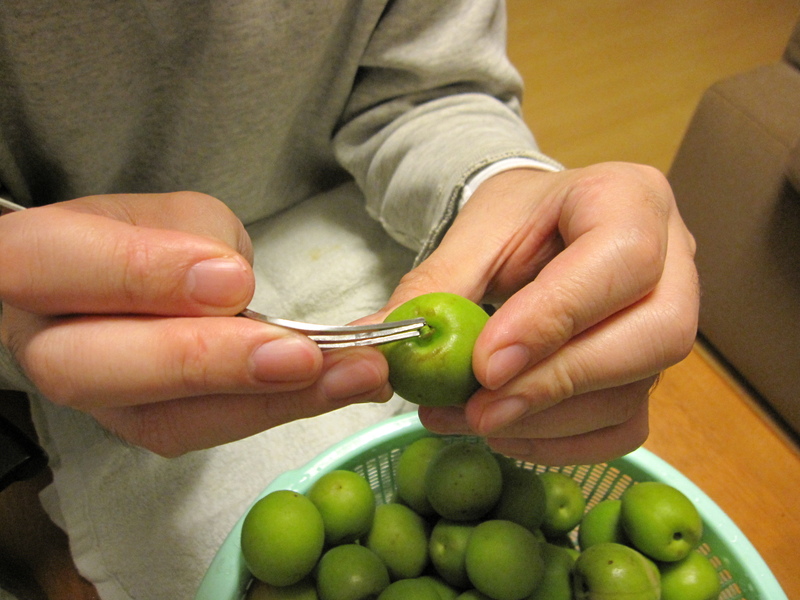 When the ume had finished soaking, we picked out the stumps of their stems, and wiped the fruit clean with a towel. 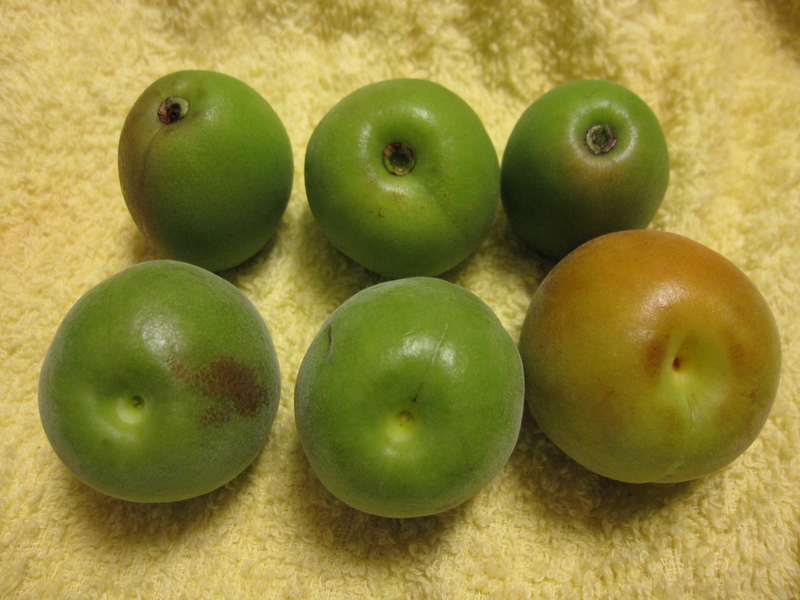 The ume in the top row still have their stems; those in the bottom row have been cleaned. They are as small and hard as new potatoes. After rinsing the storage jars with hot water, we filled them with ume and rock sugar, alternating the ingredients in layers. 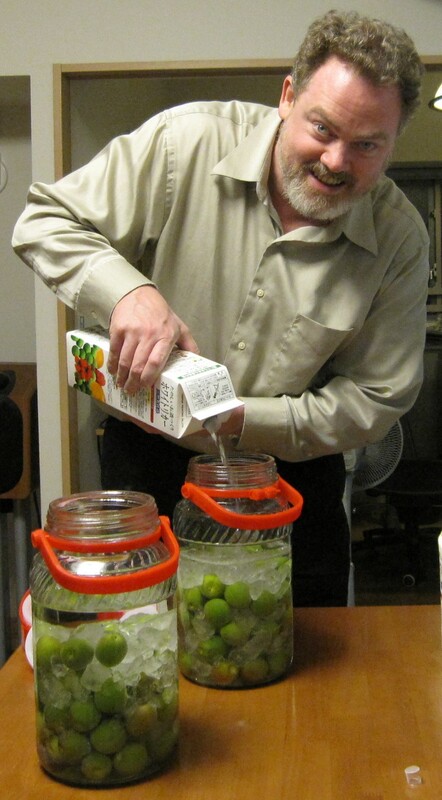 This looks good enough to drink -- but it's not ready yet. After sealing the jars and labeling their lids with the date, we put them away in a cool, dark place (under the kitchen sink) to age for at least 2-3 months or up to a year or more. Check back on this blog later to see how it turns out. We will drink no umeshu before its time. That speck in the distance is a salaryman who just walked past these azaleas in Kanda, Tokyo. Do you think he noticed them? The people of Mobile, Alabama, pride themselves on their azaleas. The people of Tokyo, Japan, hardly seem to notice theirs. Now that I live in Tokyo, where azaleas are at least as abundant, I get a pleasant natsukashii feeling whenever I see them blooming each spring. But in contrast to their Alabama cousins, the azaleas of Tokyo come and go with no fanfare at all. Undoubtedly, part of the reason is that the azaleas come into bloom not long after the sakura cherry blossoms have put on a spectacular and culturally significant display that would be a tough act for any flower to follow. In “A Flower Lover’s Guide to Tokyo” (a highly informative little book that I commented on in the post “Hanami History“), Sumiko Enbutsu writes that azaleas became popular garden flowers in Edo in the late 1600s because they were cheap enough that even commoners could buy and grow them. But the azaleas captured my imagination, so I set out to photograph them. I discovered that these flowers, although delightful to behold in person, are extremely hard to photograph. While cherry trees are tall and can be used as a frame or backdrop for a scene, Tokyo’s azaleas grow on low shrubs and can only be photographed from a crouching position, which limits the compositional possibilities. 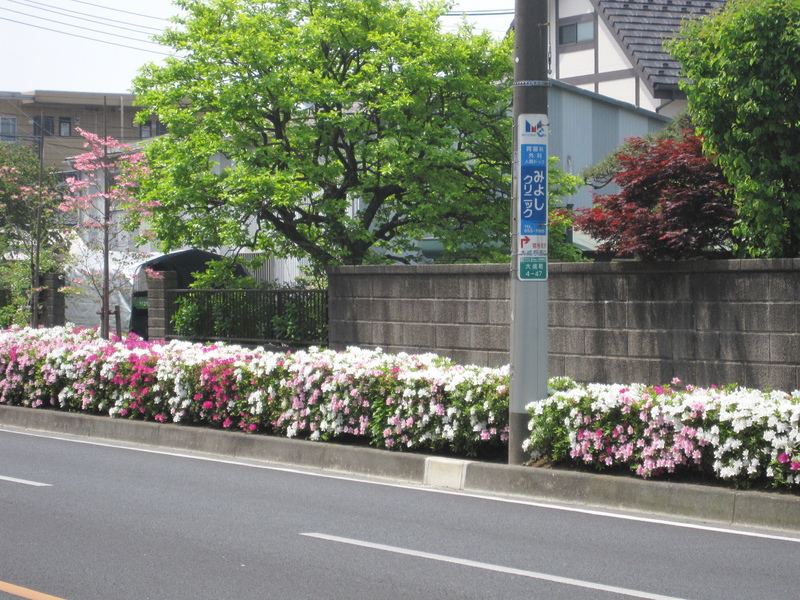 Also, while cherry trees enjoy pride of place in spacious parks and along scenic riverbanks, Tokyo’s azaleas tend to line otherwise nondescript streets where tall buildings deprive them of direct sunlight for much of the day. 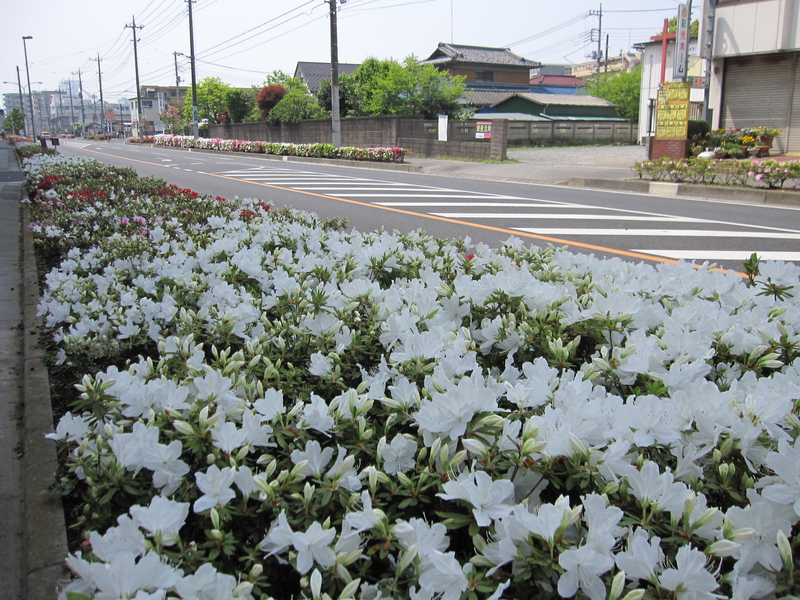 I have found azaleas on traffic islands and around the edges of parking lots. I have seen them planted beneath the windows of car dealerships and chain restaurants. They grow along the foundations of the windowless cement walls of the sports club where I swim. They cluster at the base of metal utility boxes. When you look at Tokyo’s azaleas in person with your own eyes, the drab surroundings fall away. You find yourself conscious of the flowers and little else – but a camera sees everything. After pondering this for weeks – azaleas have a much longer season than cherry blossoms – I finally realized that the drab surroundings were the whole point. Azaleas in Tokyo have a job to do, and they do it well. They appear in the boring, sterile, concrete and asphalt surroundings that Tokyo has in such abundance, and make them beautiful and charming places for weeks on end each April and May (and this year a little of June). Just imagine what the pictures below would look like without any flowers in them. If you visit Tokyo in the late spring, stop and notice how pretty they are, and how abundant. But don’t expect to find them on a postcard. 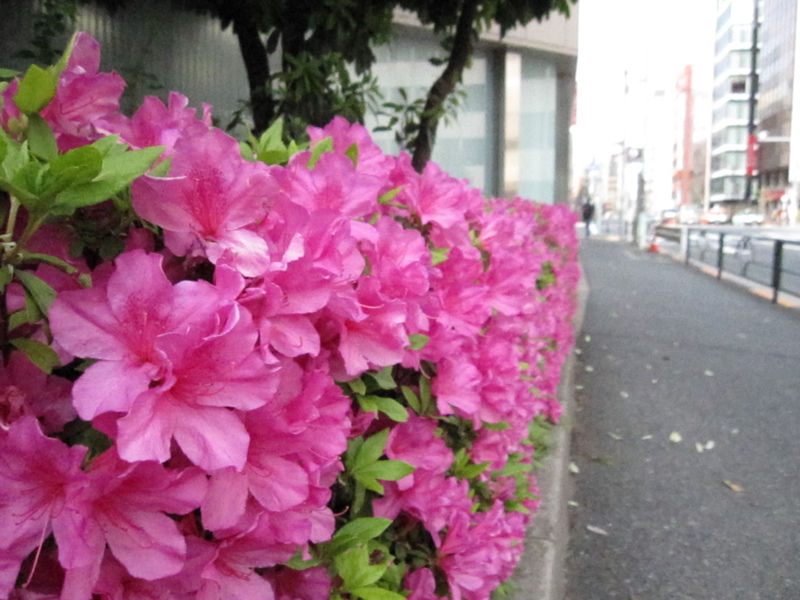 Azaleas line a street in Omiya, Saitama Prefecture, just north of Tokyo. The shade they are in is cast by the elevated tracks of the Shinkansen bullet train. More azaleas in Omiya. Imagine what this street would look like without them. Lunch at Keke: Spiraling counterclockwise from front: mapo tofu, vegetable tempura (sweet potato, carrot, shishito pepper and lotus root), fried gyoza, pork and vegetable stir-fry, senkiri shredded daikon radish, komatsuna greens with tofu, black hijiki seaweed, mackerel. But on my most recent visit to Keke, I found that things had changed. Something felt different from the moment I picked up my plate. Keke customers used to arrange their food on thick wooden platters, but now the restaurant uses slightly more ordinary (but still attractive) ceramic plates. And at the drink bar, where there used to be an array of teas and fruit juices for customers to pour into a variety of rustic pottery mugs, there is now a conventional soft-drink dispenser where people are meant to fill up stingily tiny plastic cups. On the buffet itself, the food was fine but its abundance and variety seemed diminished from my recollections of previous visits. But there were also a few new items, including sweet-and-sour pork in a dark, gloopy, tangy sauce. The pork was a clue to what had happened. It turns out that in April of last year, Keke was sold by Nagatanien Co. to the Kiwa Corporation. You can read about the sale in Japanese here and here. 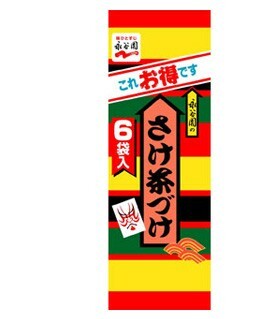 Nagatanien is best known for selling packaged ochazuke rice gruel mix (shown at right), furikake toppings to sprinkle over rice, and various seasonings. Kiwa Corporation owns numerous restaurant chains, and is perhaps best known for its Benitora Gyouzabou Chinese restaurants, which operate in free-standing form and inside shopping malls. I like Benitora, and I like their gloopy sweet-and-sour pork with its big chunks of meat. 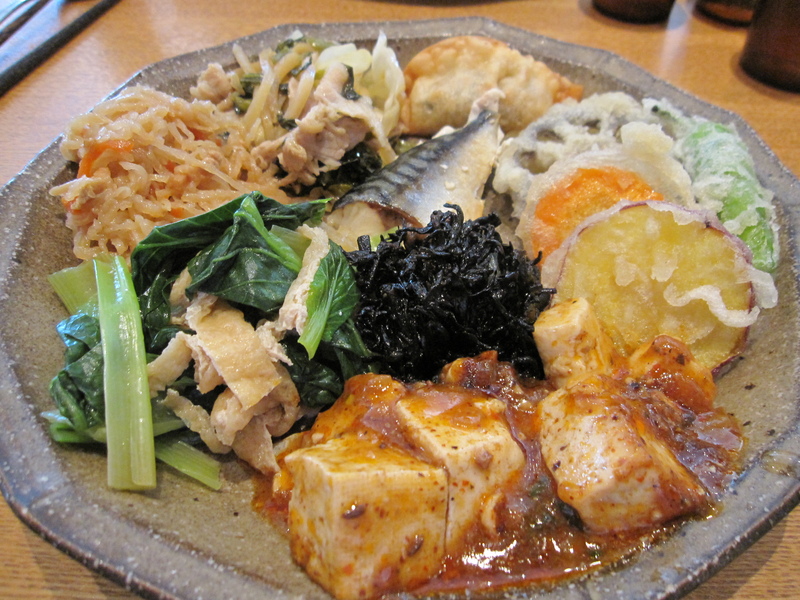 But this heavy, sugary dish seemed out of place on the Keke buffet, which was previously characterized by an abundance of light and healthy organic vegetable dishes. Other dishes also seemed to have wandered in from a different menu, such as the mapo tofu and fried gyoza. As shown in the photo at the top of this entry, you can still put together a good meal at Keke, but it’s not what it used to be. You are currently browsing the Tokyo Tom Baker: The Blog blog archives for June, 2010.